Diamond Essence uses the highest quality simulated rocks to create popular designer bracelets that will forever compliment your style. 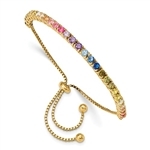 Look refined with one of the beautiful and unique faux diamond bracelets here at Diamond Essence. Choose from a variety of popular designer bracelets for women; simulated diamond bracelets that look quality without breaking the budget. 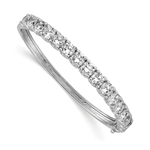 Similar to cubic zirconia tennis bracelets, these higher quality simulated diamonds are an affordable option. 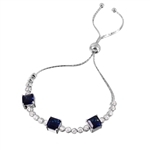 If you’re interested in a cz bracelet, browse our complete selection of tennis bracelets for women that are guaranteed to please, or your money back. 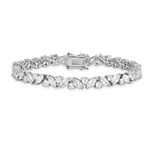 Enjoy delicate and timeless faux diamond bracelets that compare to cubic zirconia tennis bracelets, but with higher quality simulated diamonds at low prices! 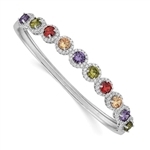 Choose from one of the numerous popular designer bracelets in a variety of hues so you can rest assured you have the perfect simulated diamond bracelet. Every one of our simulated diamonds used in the faux diamond bracelets are similar to cz bracelets & compare to mined diamonds in their production: the simulated diamonds are mined, purified and melted at temperatures above 5000 degrees F. During the heating process, the mineral slowly crystallizes to form a stone. Then, the rough cut stone is cut, polished and finished by hand to the same precise standards found in traditional mined diamonds. The diamonds are mounted precisely in various settings for quality simulated diamond bracelets at a fraction of the price!